Hardscaping & Landscaping added Curb Appeal! 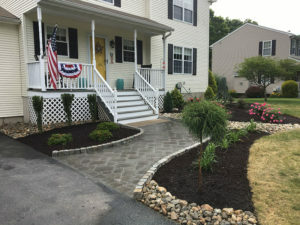 “We moved into a house which has an entire front yard full of builder grade landscaping and hardscaping. We contacted Hattoy’s Nursery, who from the start, made themselves readily available offering up suggestions on how to give our house the curb appeal we were looking for all while working within our budget. Ethan and Hattoy’s Landscaping crew were transparent, professional, and extremely easy to work with throughout the entire project. It’s always reassuring to work with a local, family run and owned business to know that they have your best interest in mind. For those reasons, we will always contact Hattoy’s Nursery for all of our future landscaping and hardscaping needs.” – Mike D.